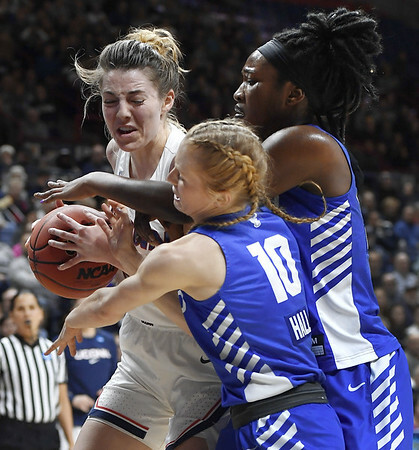 STORRS - Katie Lou Samuelson came down with a defensive rebound with 1:59 left in the first quarter Sunday night and got crunched by a pair of Buffalo players. After the foul call, the UConn women’s basketball team’s senior - playing her second game in three nights after missing three weeks and the previous four games with a back issue - reached for her back and moved slowly down court. She never looked at the Huskies’ bench, not wanting to give anyone a chance to think that something might be wrong. Samuelson was feeling sore and tired after No. 2 UConn advanced to the NCAA Tournament Albany (New York) Regional semifinals with an 84-72 win over 10th-seeded Buffalo at Gampel Pavilion, and for a very good reason. The All-American played 40 minutes Sunday night. She contributed 17 points, nine rebounds, and four assists to the cause. “I felt good. A lot of it was adrenaline,” Samuelson said with a smile. UConn will play either No. 3 Maryland or sixth-seeded UCLA Friday at the Times Union Center in Albany. She said she’ll be ready to go. Her coach was not concerned. Geno Auriemma used only one substitute - Olivia Nelson-Ododa - who came in when Christyn Williams picked up her second foul in the second quarter and when Crystal Dangerfield was called for her fourth foul in the third quarter. It was the first time Samuelson had played 40 minutes since doing it back-to-back on UConn’s trip to Louisville and Cincinnati. She played about 22 minutes in her return Friday against Towson. Dangerfield became the 46th UConn player to reach the 1,000-point plateau when she hit a 3 from the corner with 5:27 left in the third quarter Sunday night. Did it mean anything to the junior guard? Dangerfield finished 11 points to put her total at 1,003. But it was far from her best game and she knew it. The Murfreesboro, Tennessee, native had four assists and three turnovers and also spent the final 4:10 of the third quarter on the bench with four fouls. “That was my fault, something that can’t happen,” Dangerfield said. Dangerfield also ended up with a small cut near her left after taking an accidental hit from Buffalo’s Cierra Dillard. She didn’t miss any time as a media timeout followed the call but the 93.1 percent free-throw shooter did miss her first from the line. Dangerfield did make her final two from the stripe to close out the game’s scoring. As the Huskies ran off the court to their locker room following the win, the thought hit Samuelson. She and classmate Napheesa Collier had played their last game for UConn at Gampel Pavilion. Samuelson and Collier are the third straight senior class to go unbeaten at home in their four years here, finishing 35-0 on campus and 24-0 at the XL Center in Hartford. A crowd of 6,390 - bolstered by free tickets for students - attended Sunday night. UConn will take a 93-game home winning streak into next season. The Huskies already own the NCAA record of 99. Forty-five fouls were called by referees Felicia Ginter, Pualini Spurlock, and Mark Resch, 21 on UConn. Megan Walker had three fouls while the other four Huskies’ starters at four each … UConn has given up 46 offensive rebounds in its two NCAA games. Buffalo had 28 second-chance points … The Huskies are 27-2 in second-round games with the losses to Clemson (1990) and Vanderbilt (1992). Posted in Newington Town Crier, UConn on Monday, 25 March 2019 21:05. Updated: Monday, 25 March 2019 21:08.